The King’s Evil. Not a value judgement, but an unpleasant and unsightly disease which, it was believed, could be cured by a monarch’s hands. Charles II ritually touched about 100,000 people over his 25-year reign, but, as Andrew Taylor tells Historia, this was a matter of faith – and politics – as well as of healing. In the 17th century, the King’s Evil was a commonly-used term for the disease of scrofula. But it was much more than a disease: it was where orthodox medicine collided with a form of magic, and where political expedience ran side by side with religious belief. Scrofula is “a constitutional disease characterized mainly by chronic enlargement and degeneration of the lymphatic glands” (OED). It particularly affects the lymph nodes of the neck and is associated with parasitical bacilli that may be tuberculous or non-tuberculous. It’s often transmitted through unpasteurised milk. Googling images of its victims gives an uncomfortably vivid glimpse of how disfiguring the condition can be. In the past, scrofula was sometimes fatal as well. It could also lead to blindness. Nowadays, depending on its type, it can be treated, usually successfully, either with a tuberculosis treatment and antibiotics or by surgery. 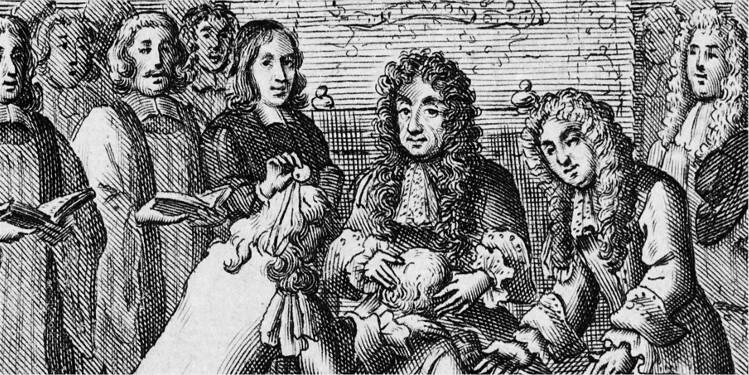 During the reign of Charles II, scrofula reached epidemic proportions. The most effective treatment was considered to be the Royal Touch, a survival from the Middle Ages. In the King’s 25-year reign, he laid hands on about 100,000 of his English subjects in the course of elaborate healing ceremonies. Given that England’s population was about five million people at the time, that equates to two per cent of the population. Sufferers came from as far afield as the New World and Russia. Though cures were rarely instantaneous, there’s very little evidence of anyone complaining afterwards that the treatment had no effect at all. From our 21st-century perspective, we can speculate that perhaps the disease happened to go into remission of its own accord, or a psychosomatic process was responsible. In Stuart England, however, the King’s miraculous powers, which in this period were solely used for the treatment of scrofula, were taken for granted as a fact of life. In England, the first convincing evidence of royal thaumaturgy is during the reign of Edward I in the late 13th century. The French monarchy had a similar tradition. Over the centuries, and particularly after the Reformation, its nature evolved. Curiously enough, its heyday was in the later 17th century, at a time when the Royal Society was founded, and when people like Newton, Harvey and Hooke were laying the foundations of empirical science. The ceremonies were religious in nature – indeed, the order of service was printed in the Book of Common Prayer. The King might touch as many as two or three hundred sufferers on a single day. In London, the Banqueting House at Whitehall was a frequently-used venue. – often stroked – their necks while a chaplain read out Christ’s words to his disciples after the Resurrection: “They shall lay their hands on the sick and they shall recover” (Mark xvi.14). This central act was surrounded by a religious ritual of prayers and readings. Patients were given a touch-piece, a specially minted gold medal (originally a gold coin, the angel), which was often worn around the neck to ward off disease. These occasions can’t have been pleasant. Even in an age with different standards of hygiene from our own, the Gentleman Ushers were obliged to provide ‘Odorofferous parcells‘ in the hope of masking the smell of the poor and the sick, and the King washed his hands in rosewater after the application of his touch. The ceremonies were not only tedious and time-consuming, they were expensive and administratively complicated. Charles II was a physically restless man, easily bored and perennially short of money. He was notoriously reluctant to apply himself to business for any length of time. Yet throughout his reign he sat on his chair of state for hour after hour, listening gravely to the mumbling of his chaplains’ prayers and stroking the necks of the subjects who knelt before him. Why did Charles II place so much importance on the ritual healing of the sick? During his years in the wilderness, the ceremonies were one of his few means of asserting his unique royal status. 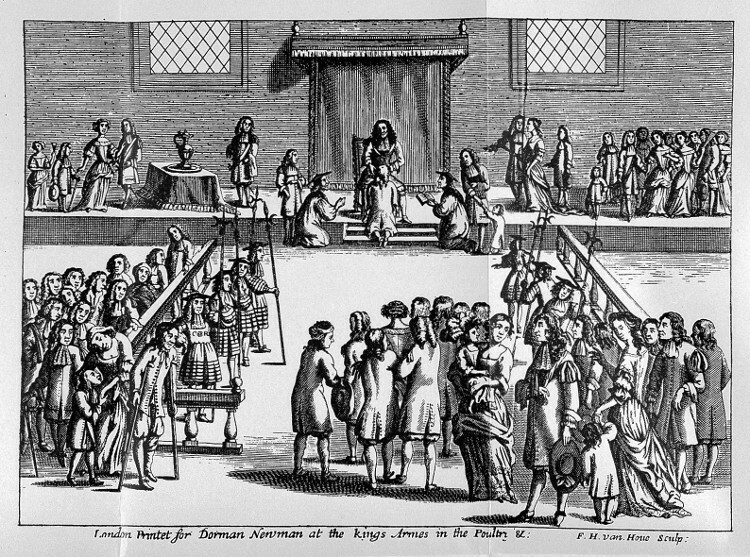 In the 1650s enterprising English merchants acted as travel agents, assembling parties of patients and bringing them over to the King in exile. Another reason – perhaps the main one – was simply that there was a huge demand for it. Ritual healing was a way of shoring up the quasi-sacred status of the monarchy. The King was God’s anointed, and therefore he enjoyed a special relationship with the deity. What better way to show that God was on his side than by performing miraculous cures? Christ himself had performed such thaumaturgy. It was something that neither a parliament nor a Cromwellian protector could do. There was a wider, theological underpinning to the popularity of the Royal Touch. Most people in the late 17th century believed in an active, personal God who was all too ready to punish sinners. 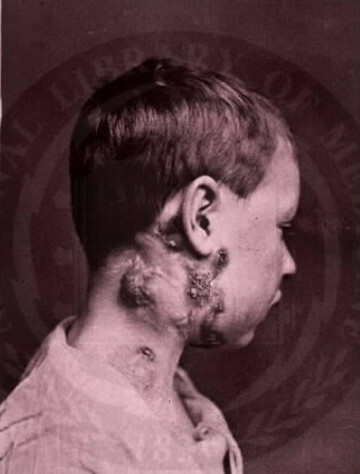 Disease was often seen as punishment for sin – not necessarily the patients’ own, but that of the society as a whole. God, through the King, was absolving sin as well as curing a disease. Fortunately Charles’s lax morals in his private life were no bar to this: there was a distinction between the monarch and the man. 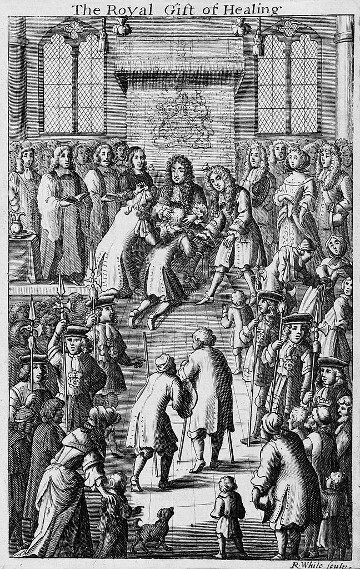 Perhaps Charles II carried out ritual healing because his subjects expected it of him. Or as a royal marketing exercise, a conscious strategy for reinforcing the Stuart brand, whose authority had been severely damaged by the execution of Charles I. Or, as king, he truly believed that God had bestowed on him and his forefathers both the ability and the obligation to heal his subjects. Or perhaps it was an unthinking combination of all three. Charles’s niece, Queen Anne, was the last English sovereign to use the ceremony. In 1711, the infant Samuel Johnson was taken to London to be touched for the King’s Evil. But, as Boswell later recorded, the treatment failed to work. Andrew Taylor has published more than 45 books, mainly crime and historical novels. He’s won many awards, including the CWA’s Diamond Dagger for lifetime achievement in the genre and, on three separate occasions, the Historical Dagger. 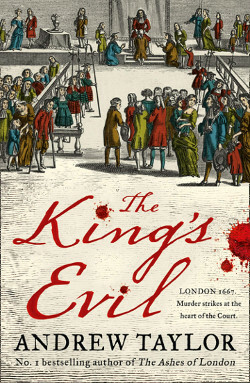 His latest novel, the third in his Marwood-Lovett series, is The King’s Evil (HarperCollins). Read Historia’s reviews of The Fire Court and The Ashes of London, the first two Marwood-Lovett books.